Providing income security for older persons, ensuring healthy lives in old age, ensuring access to health care for older persons and providing supportive environments to older persons are among the requisites for leaving no older person behind. These priorities were established with great foresight when the World Assembly on Ageing adopted the Madrid International Plan of Action on Ageing in 2002, to create a “society for all ages”. 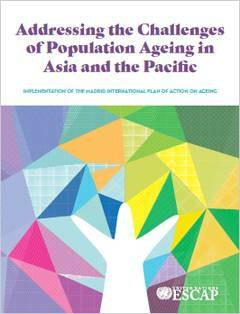 Addressing the Challenges of Population Ageing in Asia and the Pacific argues that with effective policies, population ageing can herald a period of sustained progress. Efforts to achieve the Sustainable Development Goals and to invest in people emanate from the core values that were agreed to in the 2030 Agenda and the Madrid Plan of Action. The growing population of older persons will benefit from investments in health care and education and from adequate and sustainable social security systems. With productive employment and the promotion of savings and investments, population ageing can be accompanied by robust economic growth.